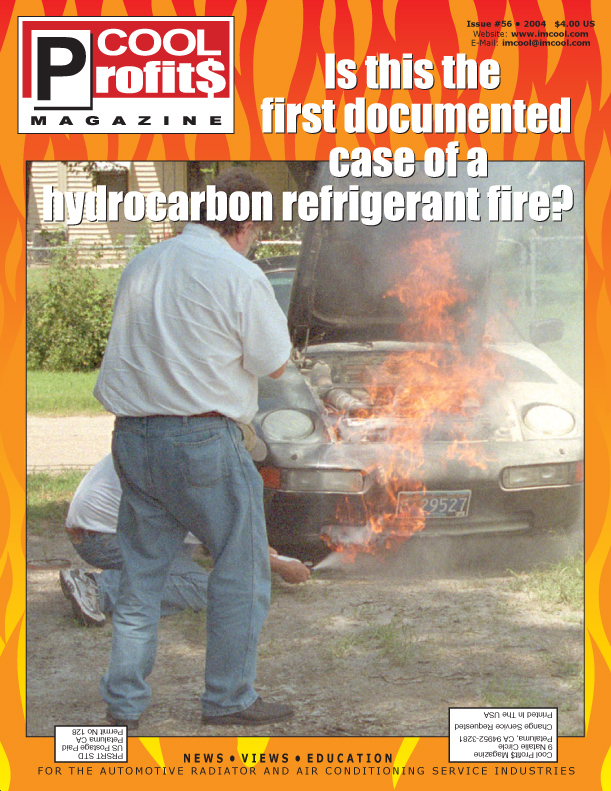 Is It The First Documented Hydrocarbon Refrigerant Fire? 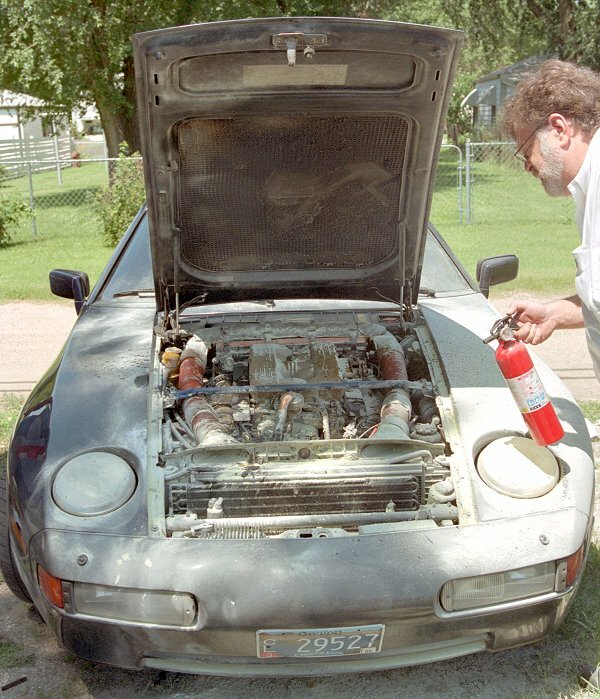 On July 11, 2004, at the Porsche 928 Owner's Club International Convention in Wichita, Kansas, a friend told Louie Ott that the first sign of a problem was when he spied a slight tongue of orange flames suddenly poking out from underneath the right front end of Louie’s 1987 S4. It was followed almost immediately by the whump of a hood-bending explosion, a red-orange ball of flames shooting out from under the car and clouds of smoke; lots of smoke. All this as Louie, trying to gauge his distance from a nearby fence, was very slowly backing out of a small parking area. Louie’s total memory of the event is not as crisp and clear as he would like, but he does remember his first indication of a problem: the sound and sight of a white vapor streaming and hissing out in front of the hood. 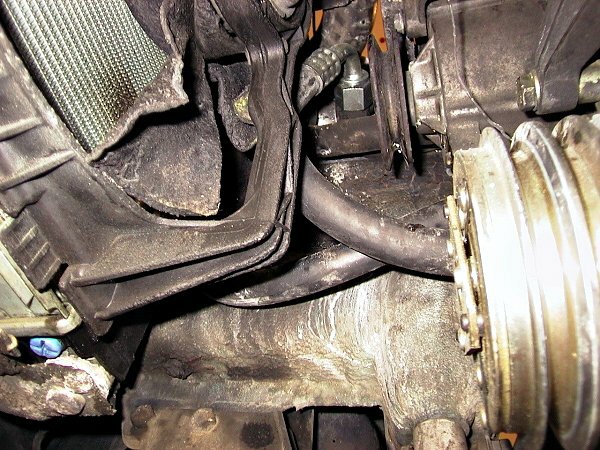 His thought at that time—but only for a very short period of time—was, “Oops, looks like a coolant hose broke.” But then came the BOOM, and it became obvious to Louie that his A/C refrigerant was burning, and that he’d better exit the vehicle. Above: Porsche owner Louie Ott (partially hidden by Ernie Swersky) is on his knees trying to get dry powder into the base of the flames that are streaming through the grill. 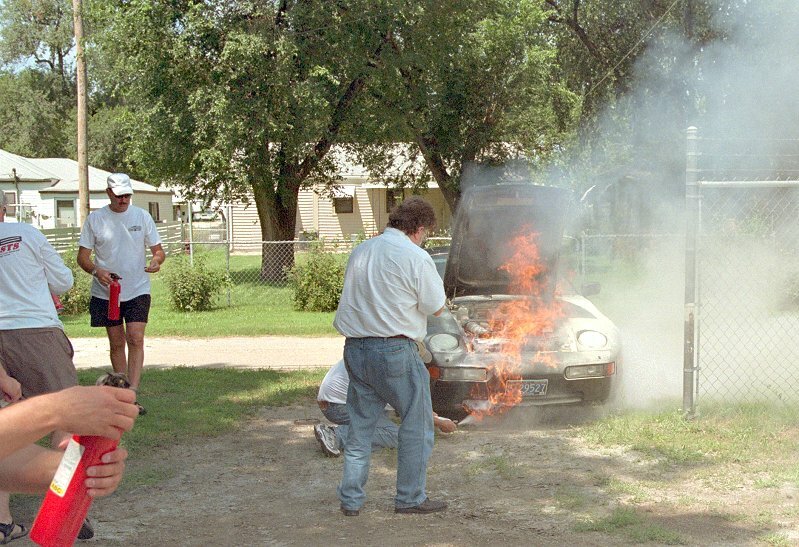 After having the presence of mind—and the courage—to pop the hood after the explosion, Marc White (rear left wearing the bill cap) approaches with a fresh extinguisher. But let’s let him take over the story. Here’s his email message to Cool Profit$ Magazine of July 15th. Louie Ott: “Recently, I installed a replacement compressor and new hoses. The low side hose was 2 or 3 inches too long. This extra length caused the hose to have an "S" bend that put it close to the electric fan blades. I tied it back so there was ample clearance. I have used Enviro-Safe™ as a refrigerant before, and liked the performance. Plus I liked the fact that it was environmentally friendly should it ever leak from the system. My S4’s system is designed to use 37 oz of R12, so I installed the recommended amount of Enviro-Safe: 12 oz (two 6 oz cans). On the way to Wichita, from my home in Oregon, I threw a belt from the compressor during a period when the A/C was off. I had the belt replaced in Salt Lake City and the mechanic expressed concern regarding the too long suction hose and it's proximity to the fan and compressor pulley. It appeared that when the belt finally slipped off, it took out some of my nylon tie straps. There was also some scuffing on the hose from the fan and where the hose had slightly rubbed the compressor pulley. Not much and not serious at that time. He tied it back even more securely than I had. We couldn't see why the belt had come off. The compressor and crank pulleys were aligned and tension was ok. We speculated that a loose breather hose end might have gotten into the belt. There were no further problems until the dyno runs at Wichita. On the first run, the belt threw again. I can't be sure, but I suppose it snapped or stretched the tie straps and let the hose contact the fan. I did three more dyno pulls and the hood was closed. The car was unstrapped and I backed out of the building. Soon after, I heard the rapidly escaping refrigerant. I thought I had blown a coolant hose until the explosion and fire, and then I knew what it was. The pictures tell a good story of what happened and it would have been a huge disaster if it had not blown where it did. There were several car enthusiasts around with fire extinguishers in their cars. It took 5 or 6 extinguishers to get the fire out. I was out of the car with my extinguisher quickly, but others were already on it before I got around to the front. 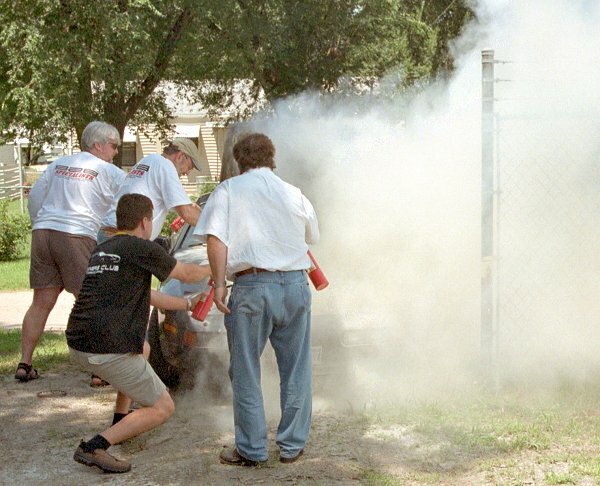 Above: Porsche owners quickly became volunteer firemen. Later examination showed where the fan blades had cut through the outer sheath and into the protective braid. I suppose the extra system pressure from the heat of the dyno runs and weakened hose caused it to burst. Initially, I speculated that the escaping refrigerant and oil was blown back on to the hot exhaust. The oil ignited and the flame from the oil caused the refrigerant to ignite. I had ester oil in it. I experimented today with trying to ignite ester oil on a hot surface heated by a torch. I couldn't do it even on a red-hot surface. The oil would burn only if it was injected directly into the flame of the (propane) torch. I didn’t mist the oil to check ignition properties. The exhaust pipes had probably cooled to around 1000°F by the time the refrigerant escaped, so I doubt that the ignition came from them. The Enviro-Safe is reported to have an ignition temperature of 1585°F. I think a more likely source of my fire was the arcing of the fan motor brushes igniting the refrigerant. The refrigerant escaped for about 3 or 4 seconds before the explosion. It was the explosion that bent the hood up about an inch in the center on both sides, and lifted the right front corner about a half-inch. I'll attach some pictures. 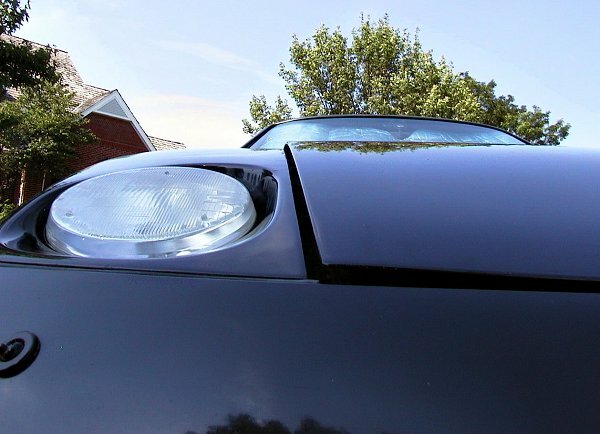 I had “Auto Craft,” a Wichita body shop, straighten the hood and they did a good job. They also cleaned the extinguisher residue off the exterior and polished the whole car. That powder was everywhere. 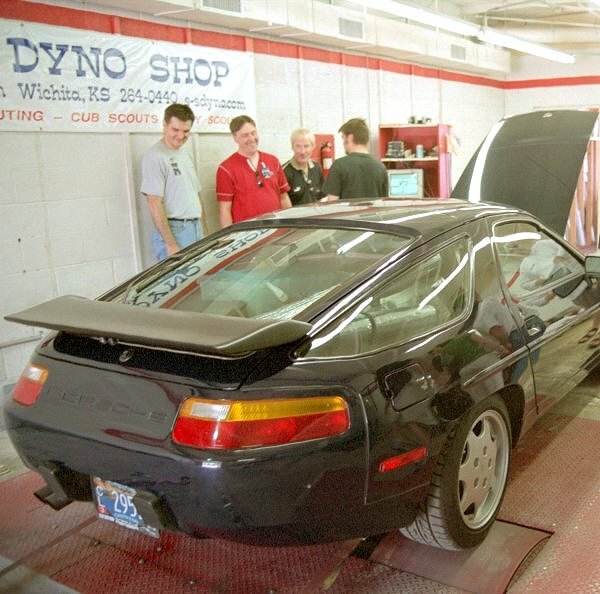 Right: Admirers of Louie’s 928 at Wichita’s Dyno Shop. I temporarily wired in power to one fan so I could get home. The main wire harness in the front of the engine has some burned places and I'll splice in good wires there. I plan to take the hose off and get it fixed. The burst spot should be evident then. I still have a lot of work to do in the engine bay. One fan unit is entirely melted away. The A/C clutch wire is badly burned as is the fan power wires. I may have to get a new A/C clutch. Above: Helpers dive in to disable the compressor drive belt which had slipped off during a dyno pull. Little did they know of what was soon to come within that engine compartment. Marc White's account of the events: “OK Louie, here's how I remember it...the whirring hiss started just as you reached that fence area, which was undoubtedly the refrigerant whooshing out hi speed, and spinning the fan with the pressure. It sounded like a jet engine! I was signaling you to open the hood, I couldn't yet imagine what was making that sound except I remembered the belt removal on the dyno and thought you maybe had another belt issue (maybe from fragments?). Anyway, I wasn't worried about an explosion or fire, just the weird sound. I think you shut the car off (I'm almost sure of this) as you and I were looking at each other with curious glances (you in the car, me walking towards the hood to open it). You popped the hood release as I approached the front of the car and WHOOOOM! A fireball erupted from the front of the car, low and yep, it scorched the hair off my legs (but no burn of the skin). Note I am not positive if the hood popped before or after the explosion but it was close either way. Ernie takes one last look for leftover smoke…and fire. It also buckled the hood but I didn't notice that at the time. This startled me but I was still going for the hood release and noticed wisps of smoke coming out from the cracks on either side of the partially released hood (like 2" in front open). ALARM!!! I am yelling and people are running, FIRE, FIRE and someone hands me a fire extinguisher as I am still right by the car, still ready to open that stinking hood. But I didn't, I started squirting the flames licking up from under the hood by putting it in the small cracks on either side, then squirted more under the front of the car as it was apparent flames were coming out from below as well. I wanted to get to the front of the engine knowing of the rubber fuel line across the rails and still didn't know where or what the source was. Soon it was emptied and I think I opened the hood, tried to squeeze out more with little luck. Others were on the scene with their extinguishers and shooting it, still smoke and a few flames. 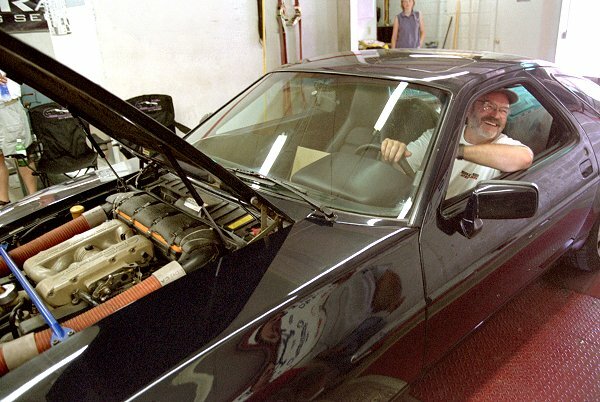 Above: Louie Ott, about 15 minutes before the fire, happily anticipating his three dyno runs in a sparkling clean and polished 928 S4 that’s free from burned components and extinguishing dry powder residue. Mike Schmidt: “Hi Guys, Okay, here's my recollection of what happened. Louie was backing out through the gate when there was a loud bang. When I looked over, there was the loud hissing noise and the kind of whirring noise that Marc mentioned. There was a white cloud of refrigerant blowing out the bottom of the car near the front tire. Thinking of the A/C compressor belt that had come off twice already, my initial thought was that the compressor had some sort of problem and had self destructed. No thoughts or signs of fire yet. The hissing, whirring, refrigerant leaking out occurred for a short while before smoke and flame from a small fire could be seen through the air intake slots in the nose of the car. I was standing kind of far back, so (I) probably saw that, where those right by the car may not have. That was when there were already a couple of people right at the front of the car trying to get the hood opened. The smoke and relatively small fire that I initially saw was going for a short time when the fireball/big whoosh that burned the hair off Marc's legs occurred. It seems like that happened right about at the same time as the hood was being opened. The fireball went down towards the ground and outward from under the car when it happened. I'm sure it seemed longer than it actually was, but it seemed like it took a while to get the fire under control with the fire extinguishers. I know at least one or two of the extinguishers were being pointed fairly high on the engine. I know you're supposed to aim for the base of the fire. From back where I was standing, I couldn't tell if the fire was actually that high on the engine. After it was out, it was pretty clear that the fire was centered pretty low in the engine compartment. I was pretty surprised at how little real damage there appeared to be from as big as the flames were and with as long as they lasted. There was a mess from the fire extinguishers and some melted plastic residue, but not really that much damage. Above: Underneath view of the right front engine compartment. As part of the autopsy Louie performed when he got home, he photographed the engine-to-radiator section from underneath and identified the parts for the benefit of Cool Profit$ readers. Be sure to notice the hose burst point and melted fan blade. Major kudos to Marc White, who performed one critical operation that made a huge difference to the rest of the save— getting the hood open. There were flames coming out around the edges of the hood, but it was stopped at the safety catch. It takes guts to put your hands in the flames (if I remember correctly, Marc wrapped some cloth or something around his hands) to release the hood. And of course, great work by everyone else who joined in on the save. I'm stunned (and really happy to hear) that the car started (I almost said “fired”) up again. I was expecting this to be a major loss. The Villain: A little-too-long suction hose that just didn’t want to be confined. I'm going to be that much more careful when working with anything flammable from now on. Never want to see anything like that again. Above: The Screamer! Here’s the infamous leak. The hose is DAYCO® Futura™, 1/2”. Rubber hose meets rotating, sharp, hard, plastic fan; fan wins. Ernest Swersky: “Louie had just completed his second dyno pull and, so far, had provided the only real drama of the day. Somewhere in the neighborhood of 4K rpm, his A/C belt broke and wrapped itself around the crank pulley. Jay Kempf (or Tom Middleton) dove into the engine bay and with the help of a pair of cutters unwrapped the belt. Louie's last run was uneventful, except for a hissing sound from the engine bay that I thought was A/C condensate on the exhaust. Louie then backed out of the bay. Above: View from underneath. 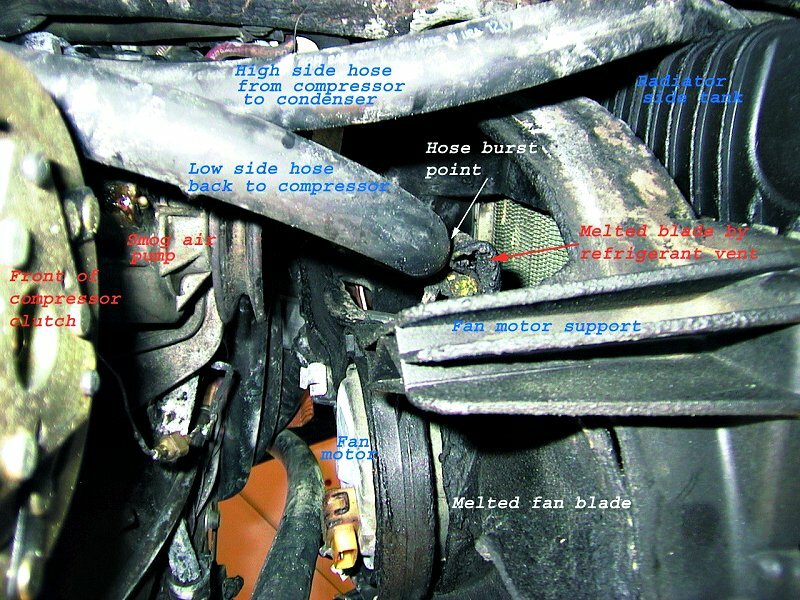 While the rubbed-in hose hole is hidden behind the fan mount, the damage is visible: destroyed fan blade and scorched radiator core. Oh, the flames that got the radiator went on to get the condenser as well. From “GlennT,” as posted to the Aircondition.Com bulletin board, who had seen my post saying that I would cover this event in Cool Profit$ Magazine: “John, I ask that if you publish anything about this incident that you please publish all the facts and not some article like the infamous ‘grenade under your hood’ thing that MotorWeek did years ago. HCs are a hot topic and opponents are just looking for a single incident to stomp on them. I use HCs and like them. But honestly, when you use the refrigerant that the system was designed for you do not need any blends. The reason we use blends like HCs is because the cost of retrofitting is too much for many bread winners to absorb. If I had a car this beautiful it would use r12 period. This is just my 2¢. For all those looking to use this as an example to NOT use HCs, I urge you to rethink your position. Those that can afford to use the proper refrigerant and procedures, well, God bless you. For those who have to balance risk with cost, keep in mind that there are over 5 million cars on the road today using HCs worldwide. This is just one example of a accident that may or may not have been preventable. I can say with some degree of confidence that if this system was the stock OEM, then the line would have been held with something a little more high tec than a tie wrap. So maybe this was preventable, you decide. No, a grenade did NOT go off under THIS hood; but something sure gave it a ride. Was it the HC refrigerant, atomized oil or both? Would it have happened with R-134a or R-12? We’re researching that for the next CPM issue. What caused the fire to start, and what actually burned? No doubt that many reading this article have already made up their mind as to the cause of the fire and explosion: flammable refrigerant—end of story. While no one claims that hydrocarbon based refrigerants are not flammable, there will be many objecting to it being identified as the sole cause. Those folks will quickly point out that ANY REFRIGERANT carrying oil can and will burn, especially if the oil gets atomized, as in a violent escape. In and effort of fairness to all refrigerant and oil vendors, I’m postponing a detailed flammability coverage until the September/October issue of Cool Profit$. This gives adequate time for these vendors to prepare and submit their data. However, a DuPont technical representative was quite specific when he said that pure (no oil or air) Suva® R-134a was nonflammable under these conditions; a spark from fan motor brushes would not ignite it. This was not necessarily the case with an oil-134a or air-134a mixture. The same cannot necessarily be said about a pure (no oil or air) HC-12a refrigerant. The MSDS clearly says that it is flammable. But we’ll wait until next issue to split the oil and air hairs. Additionally, during my research I heard claims that inhaling R-134a causes severe headaches, and that if it comes in contact with human skin it will destroy those cells (flesh is “eaten”). To technicians who have suffered from such headaches and/or damaged skin, and attribute it to R-134a exposure (or any of the refrigerant oils), please let me know; I’d like to document your conditions in the next issue. By next issue we’ll probably have gotten from Louie an accounting of total damage, repairs and replacements resulting from the fire and explosion. Suggestions, questions and comments are welcome, and will be forwarded to Louie regularly. Vendors: If you plan to provide input to the flammability and toxicity feature in the next issue, please contact Cool Profit$ to confirm the format. Note that the article is targeted primarily to A/C technicians, not necessarily to engineers, chemists or academics. I’d prefer that a one or two-paragraph summation introduce any multi-paged documents, charts or formulas. If this article interested or maybe even helped you, please, if you have not yet done so, become a Cool Profit$ subscriber. For as low as $1.25 per issue you’ll encourage us to pursue and present articles like these in a format that’s quite unique in our industry. Thank you.